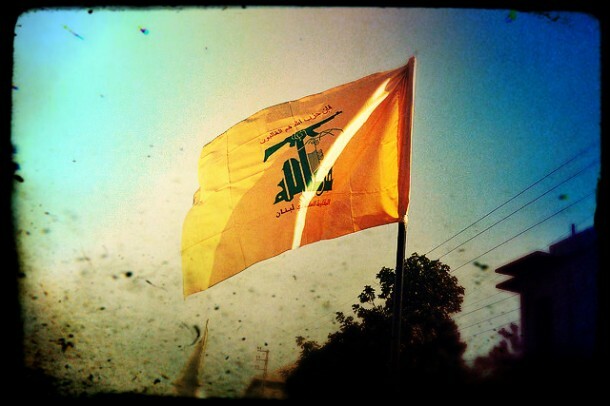 A story that was ignored by the Media in Greece and Cyprus was the unanimous decision of the Ministers of Foreign Affairs from every member-state of the EU to add the military wing of the Lebanese party "Hezbollah" in the EU Terror List. This proves that the governments in Greece and Cyprus are everything but independent. Instead, they are controlled by Zionist power centers in the EU and other places. 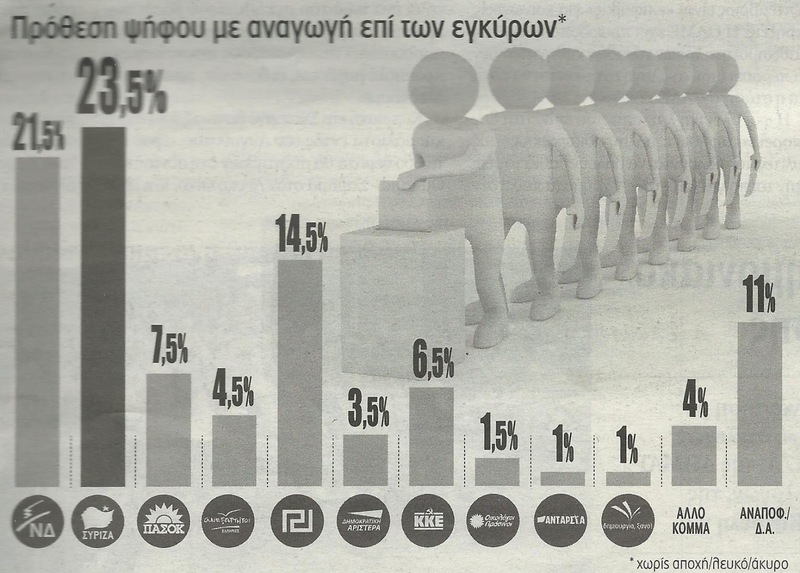 Golden Dawn polling at 20% ! 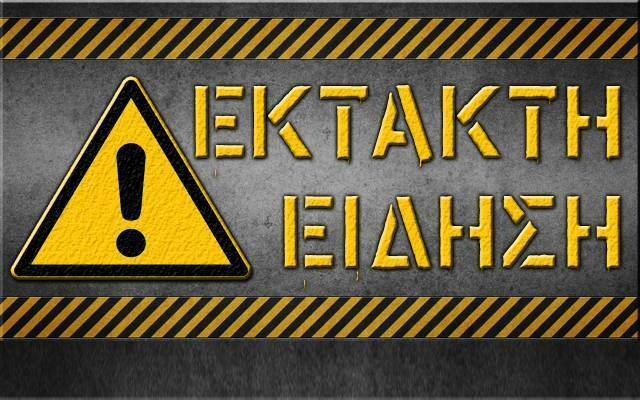 The newspaper "Parapolitika" revealed some great news about Golden Dawn, before proceeding to attack her with lies and deceits. In a 4-page article titled "The egg of the serpent has hatched", the secret poll the Prime Minister ordered , and left him speechless, was presented. According to the poll, Golden Dawn is estimated to be polling above 18% and we all know that -due to the hidden vote- our real percentage is well above 20%. This poll was also leaked last night on the "Kontra" TV channel. When the voluntarism of free labor for the benefit of the System migrates to the field of suppression, when ideological differences for issues like the modern slave trade and acts of resistance against the crimes of Zionism are punished with blood on the streets, when parastate terrorism is renamed to "struggle against the System", then we certainly live in the "New Age", the age of the Antifa. 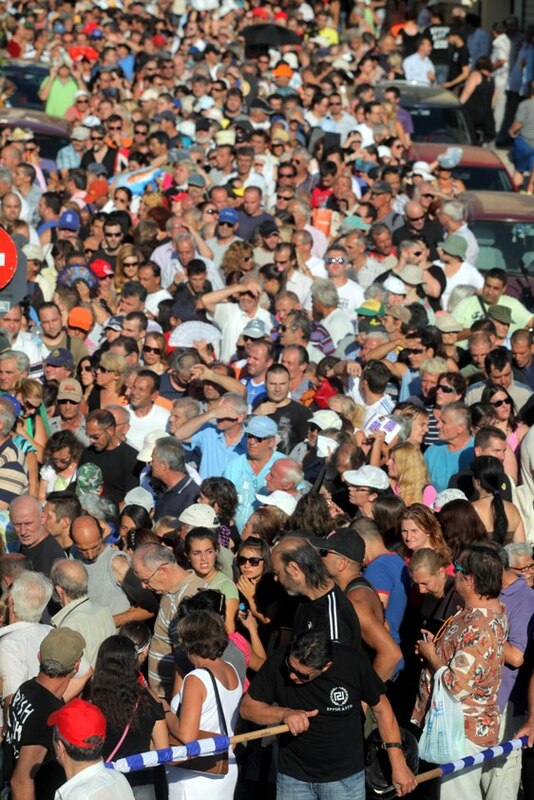 10.000 Greeks fed today - Solidarity to our Racial brothers and sisters! Ten thousands of Greeks were gathered outside the Central Offices of the Party to supply themselves with the goods they deserve! 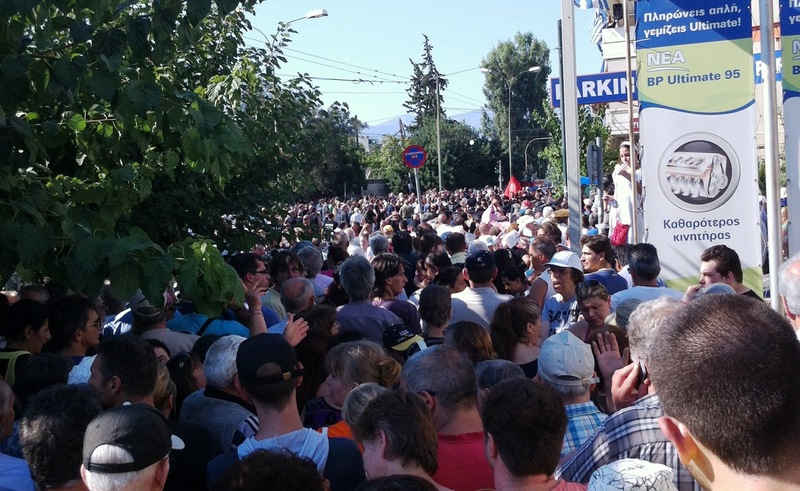 Despite the hot sun and the terror instigated by the Chief of the Police, the minister of Civilian Protection and the Mayor of Athens, 10.000 Greeks came to receive a helping hand and to show their support for the Social Nationalist Movement. 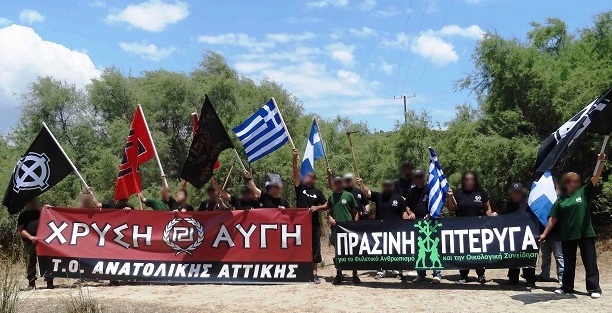 The Leader of the Golden Dawn hailed and was hailed by the People, spreading the message of the Resistance: We will not bow down to the thieves, the traitors, the criminals! The comrades maintained complete discipline and order throughout the event, helping all those attended and giving priority to Greeks with large families. At the same time, they were giving water to all those waiting in line. In the end, many tonnes of meat, fish, pasta, vegetables and clothes were given to 10.000 Greeks that are facing the disastrous (and completely intended) results of the Memorandum and the EU. Watch the Social Solidarity event Live! 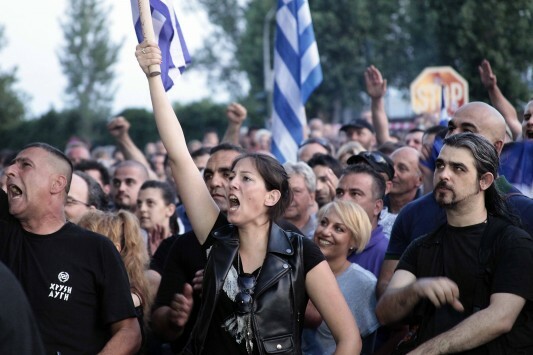 The Greek People show their defiance against the Zionist Occupational Government. The S.S. event has yet to start but thousands of Greeks are already there. Our Militia will make sure that the cops won't touch those starving souls. They are trying to ban our Social Solidarity program amidst a the financial crisis caused by a pathetic regime. The Chief of Police has outlawed every gathering in the area of Attica Square for today, aiming of course to prevent today's soup kitchen. According to his announcement, all gatherings in and around the vast area of Attica Square, from 12.00 to 24.00 today, are forbidden. Could it be a coincidence that the Social Solidarity event was to happen at 18.00? The reasons they present are pathetic. This soup kitchen gives priority to the unemployed and to the large families, and those people aren't there to threaten "public safety". 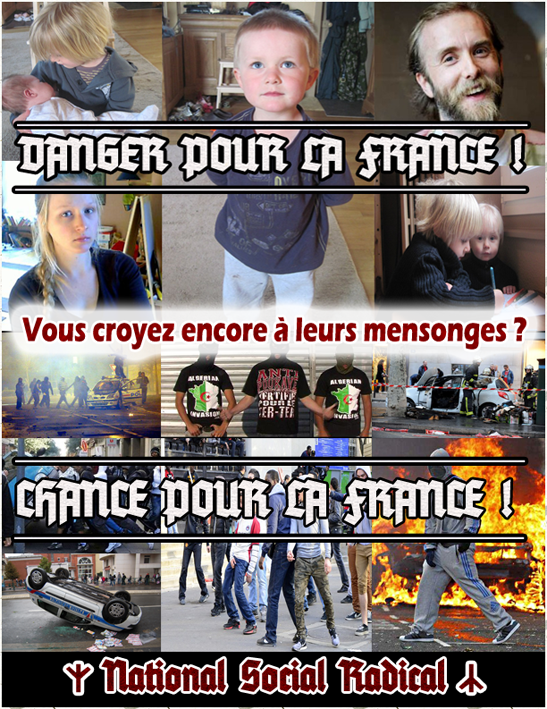 Well, let them know that the Social Nationalist movement will not back down when faced with those pitty tactics. We are ready to face them! The United Nations own definition of genocide, [260A (III) article 2] includes the most common things people associate with the word such as mass murder and bodily harm in the first two of five sections, (a) and (b). However, in a European Union member-state in 2013, the government of Greece has released a new complex tax code that specifically makes tax increases on families with more children. This violates other sections of the definition. 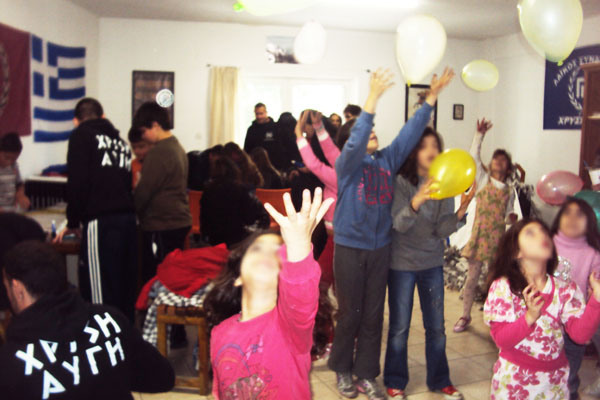 The Greek Government, IMF and EU are actively trying to stop children like these from being born. This is not a simple “across the board” tax increase to everyone, rather it even has a slight decrease for unmarried people, a stable to slight increase for most of those married with one child, and then a large increase for those with 2 children, and an even larger increase for those with 3. This is the first of its kind known in any western country. 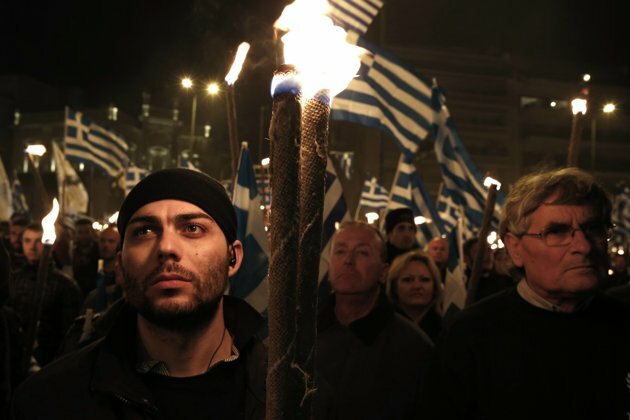 Even the "Editor's Newspaper", also known as the "Photoshop Newspaper", can no longer hide the dynamic rise of Golden Dawn's popularity among the people. From those polls we can see that Golden Dawn is the second party among the age groups of the active population (ages 18-44) and that the old parties (PASOK - New Democracy) survive largely because of the elderly. Additionally, the polls reveal that 11% of New Democracy's voters and 7% of Syriza's voters are moving towards Golden Dawn. We have received donations from all over the US and even as far away as Australia! and we cannot stress enough how much of a difference your donations will make for the people of Greece and the local neighborhoods around Attica Square! Like many places in the center of Athens, Attica Square was once a peaceful residential area with many small businesses and families, but by around 2007, the area around the square had become infested with mostly Bangladeshi, Afghan and African illegal immigrants, who used the square to sleep in, sell drugs and to rob the elderly people walking nearby. Golden Dawn stepped in and since then, after much work, the area around the square has improved dramatically, and next week this same area will be used to distribute aid to the people Greek politicians care about the least. We will continue our efforts, and we urge all of you to keep helping with the struggle, we will be announcing a new initiative very shortly and we will continue to fight until the final victory! 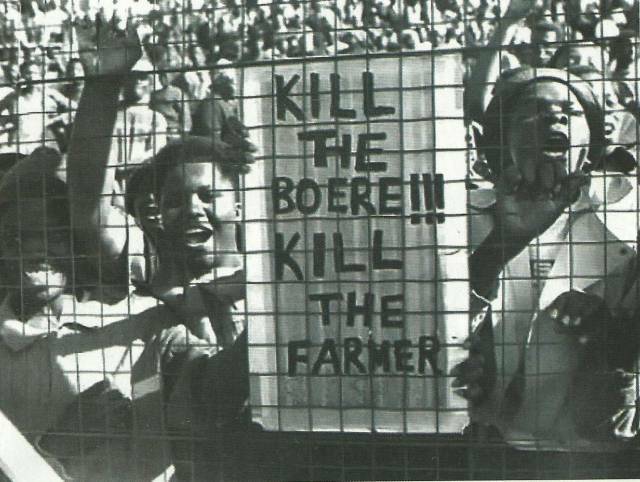 The regime of racial segregation in South Africa, known as "Apartheid" was abolished in 1990. Along with it, all the convenient theories of the System, that the Apartheid was the only one to blame for the all the hardships of the Blacks, were also abolished (collapsed is a better word). 23 years later, and with the Blacks in total command, the situation gets worse day by day. Black workers are murdered in cold blood by their racial brethren, but the reactions of the civilized world are hypotonic. Imagine what would happen if a White government committed a similar crime. Mandela's bad health condition has created many scenarios about S.A.'s future. "The Whites are afraid that their slaughter will begin with the death of Mandela", says the British "Independent" newspaper. Many websites are warning the White minority of South Africa that the death of the leader of the Blacks will fire an unmerciful pogrom against the Whites, while the country plunges to chaos. Meanwhile, the ruling African National Congress tries to take the White man's guns away, to make their extermination easier. More than 25 farmers were killed in 100 attacks within one month! The only racist hatred that exists today in S.A. is the one against the Whites. Julius Malema, former leader of the ANC youth, using "Kill the Boer" as his slogan, reveals his intention for the Whites of S.A. The "progressives" all over the world are silent about this genocide. That's the exact reason. Since they are Whites, their lives and rights have no worth. The funny thing is that if they actually cared about the prosperity of the Blacks, then they would prefer the Apartheid in lieu of a chaotic Black government. The story of South Africa taught us many things and unfortunately, it's going to teach us even more about the destruction that is caused by multicultural and multiracial societies. An appropriate introduction for this Zionist agent. 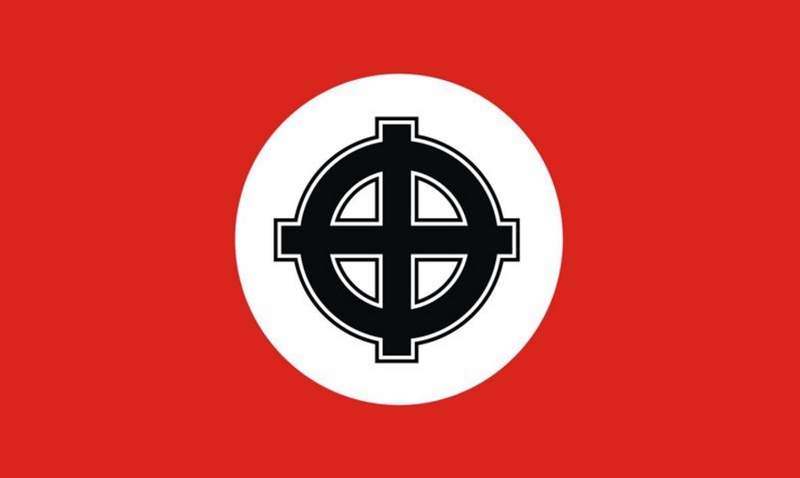 A huge banner was presented as a gift to Schäuble from the central offices of the Golden Dawn. The offices are located in the entrance to the Municipality of Athens and it was the first populated area after the Airport. They got the message as soon as they stepped in Athens. From the tinted windows of the armored Mercedes Schäuble and his gang were watching like idiots. It was the first message they received in an empty and blocked Athens. The cops panicked as they surrounded our offices. There were additional teams of RCU officers and SWAT units that created a thick perimeter around the block. The commander was yelling furiously: "They will not be close,I repeat, they will not be close!They will not put up a banner, nothing!". He was ordered to prevent all activities that would "offend" his Zionist bosses, but he failed. In an empty Athens, having only the presence of thousands of cops, unprecedented security measures and D.A. restrictions, the first thing the German usurers saw was a big RAUS! Our government may be corrupted and weak, but the Greeks resist with a strong and innovative Social Nationalist Movement. These last days a tragedy is developing on Egypt, the most populated Muslim country of the Middle East. According to info, hundreds are dead, despite the careful announcements of the Egyptian MSM and the suspicious silence of the Zionist-controlled western Media. We are watching from the screens of our TVs, in live broadcast, another "democratization" effort, made in USA. 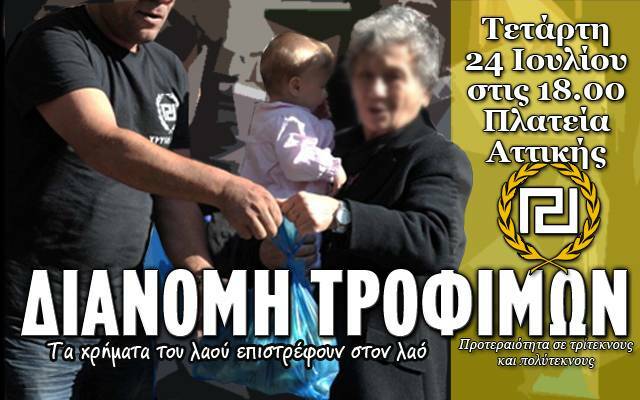 The Regional Organization of Eastern Attica distributed food to poor Greeks last Saturday. The comrades of the S.S. team welcomed our compatriots to give them food, supporting this new impoverished class our anti-national rulers have created, and let them know that they are not alone. 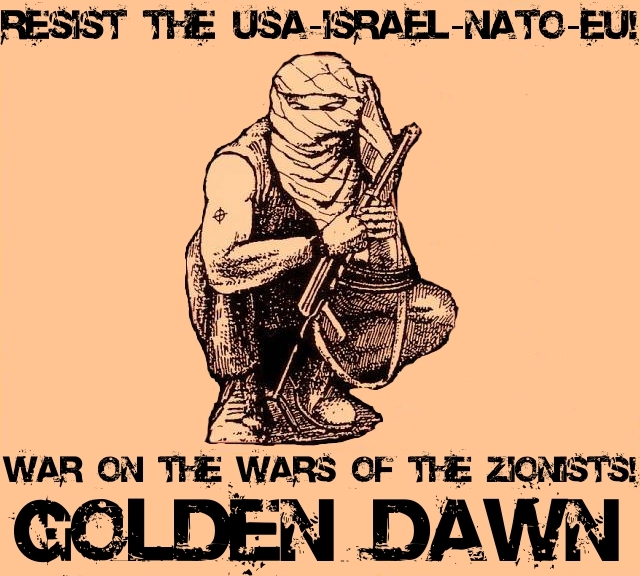 Golden Dawn will always be struggling to give them back all those things the Zionists have stole from us. Racial Socialism: An organic synonymy. Part 2 of the Social Nationalist Theory. 2) Why Racialism and Capitalism are incompatible. 3) Why multiracial Marxist Socialism is an impossibility. Comrades, the purpose of this article is to place a small stone for the foundations of our "own" socialism. We must note that for us Nationalism or Racialism (because for us Nation = Race) gives birth to Socialism and the opposite. This connection between Nationalism and Socialism is the only true ideology that goes against globalist Capitalism, because "national" Capitalism can't exist. The same applies for internationalist multicultural/multiracial Socialism, despite the unnatural visions of the Left. Thus, Social Nationalism is Racial Socialism. Being aware of certain biological, historical and financial facts, we must, using honest dialectic, construct the meaning of Racial Socialism. I believe we all understand the importance of the economic and social system for the future of the Race. If we are not ideologically self-aware we will not be able to have decent economical reasoning. We can say that we are not the "middle ground" between Communism and Capitalism, we aren't even the "Third Way", we are the ONLY way for the survival and evolution of our Race. We aren't simple hybrids of the Left and the Right, we are a new species, a result of evolution! We faced an unprecedented exclusion from the Parliament of the so called "democracy" yesterday. 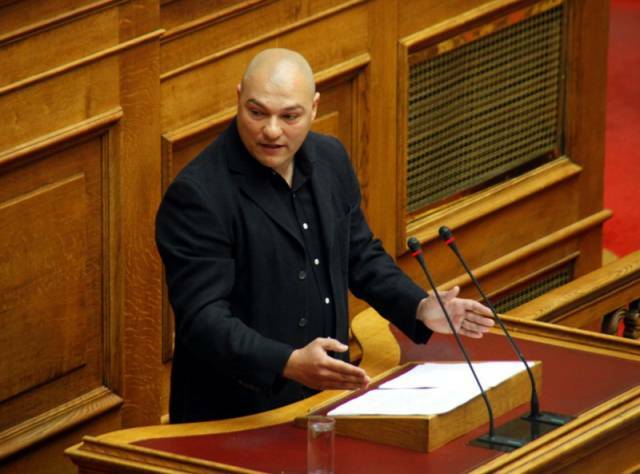 The vice president of the Parliament denied the right of the comrades George Germenis and Eustathius Boukouras to address the issue of parliamentary immunity. The comrades requested to speak throughout the whole procedure, but were ignored by the VP under the pretext that their request was "demanded the wrong time". Of course, the comrades requested to speak before the voting began. It isn't the first time they silenced the voices of our MPs, they have done the same with comrade Ilias Kasidiaris. 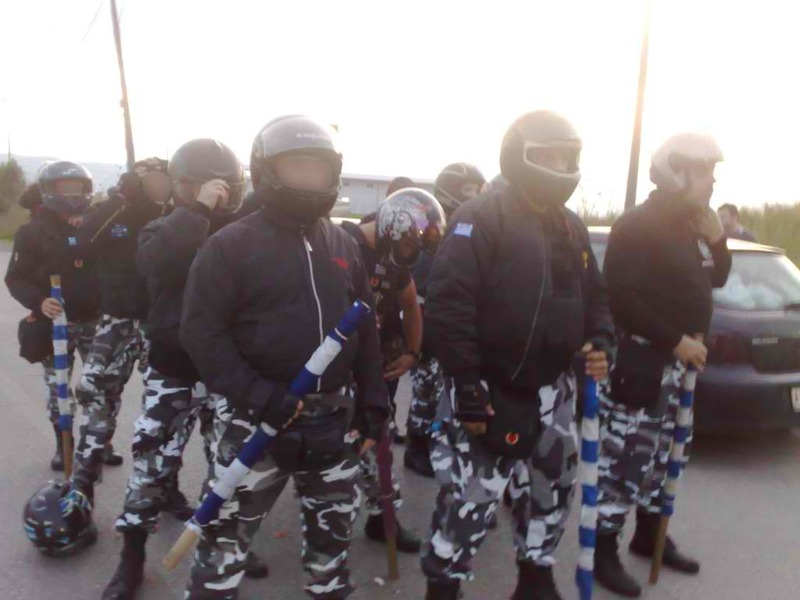 The parastate organization "Conspiracy of Fire" has attacked Golden Dawn multiple times. 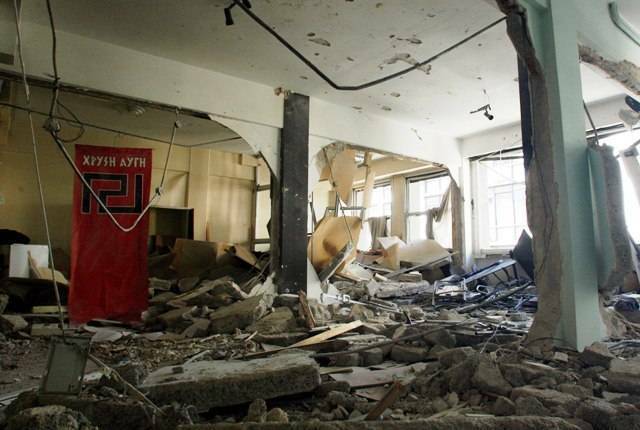 One of their bombs completely destroyed our central offices in Omonia. Today, New Democracy assumes political responsibility for the release of a terrorist. Take a break from the tiresome daily life of the 21st century and enjoy a beer with some friends and Nationalist rock, oi! 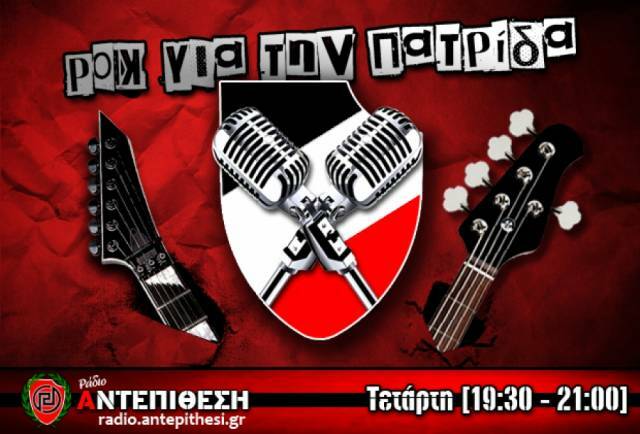 and punk music from Golden Dawn's radio station, Radio Resistance! It's been quite some time since the coalition started to govern. A coalition that has two partners, the same people that have been ruling Greece since 1974. With the alternating leftist PASOK and the rightist New Democracy, the plans of the Zionists were proceeding without problems. But Golden Dawn's age came, and those two "mortal enemies" had to cooperate unless they wanted to go to elections and have GD on the 2nd or 3rd place with percentages around 20%. 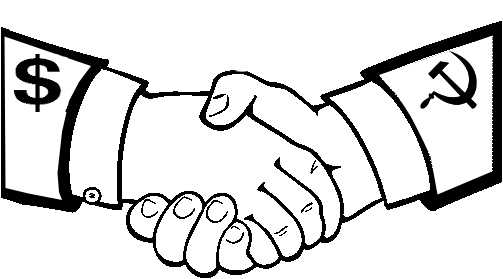 So we found ourselves responsible for the unholy alliance of those two "rivals". An alliance that nobody ever thought would live to see. 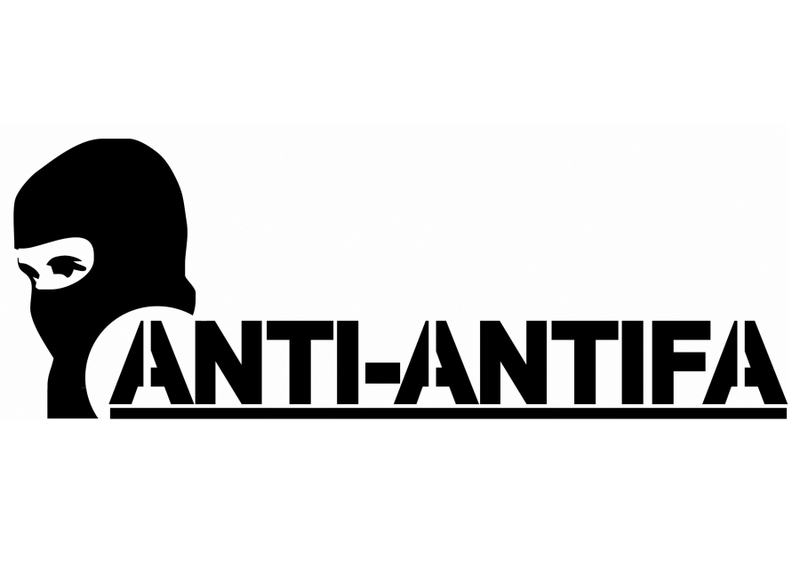 So what is the connection of Antifa with imperialism? The place is filled with posters about Srebrenica, about the murders of Serbian and Greek Nationalists, in the name of "Macedonia" that is "flooded with the blood of Bosnia" and we are wondering if all these things can have anything to do with the anarchist ideology. Who are those that fill our cities with thousands well-designed and expensive posters (even though their gatherings attract 200-300 people)? Who are their leaders? Who funds them? In the end, who is behind them? Is this ideology related to leftist or anarchist movements?